In a report by ICIMOD, including eyewitness account to me by a Lunap horseman during my recent trip to Lunana this May, Lugge Tsho was none existent until the late 60’s – Swiss geologist Augusto Gansser-Biaggi first described it in 1970. This means this lake was formed by melting ice caused by global warming. 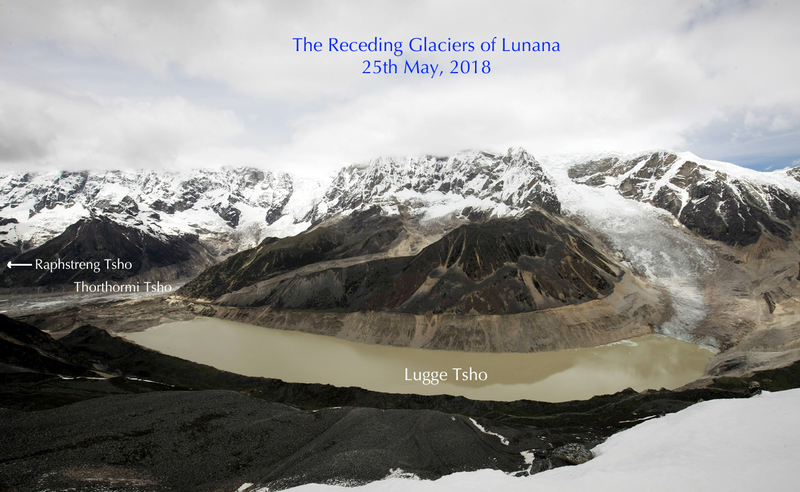 In less than two and a half decades of its formation, Lugge Tsho in Lunana became the source of a major GLOF in October of 1994, killing 21 people. The principal source of Punatsangchhu river is drying up. Bhutan's two biggest hydropower projects are stagnating on this river basin for the past many years - caused by "geological surprises"
Generation of hydro-electricity is solely dependent on continuous flow of water - but the continuity of the river flow is endangered by a situation where we are experiencing heightened level of global warming, causing receding of glaciers at alarming rates. I do not believe that successful mitigation of climate change will result in reducing greenhouse gas emissions. In the face of proliferating industrial production to meet the needs of an ever-increasing human population, I would be truly surprised if we are able to halt further depletion of the ozone layer, let alone repair it. The effects of global warming is showing us the way - it is now time for Bhutan to abandon the hydropower dream and move to other areas of investment where we are certain to succeed, and in areas where we have financial and management control. It would be suicidal to continue to tread the hydropower route, in the face of colossal disasters such as Punatsangchhu Hydro Electric Project I & II, at 10% interest, on 60% loan money.